Facts and information about the History of Clothing and regalia of Native American Indians and the War Bonnet. The authentic and traditional feather War Bonnet was favored by the chiefs, war leaders and warriors of many tribes who inhabited the Great Plains including the Cheyenne, Sioux, Assiniboine and Chippewa. Every one of the feathers in the war bonnet headdress was a symbolic reflection of the brave deeds and battles that the warrior had been engaged in. The war bonnet was a symbol of high respect and a visible display of a warrior's bravery, honor and standing in his tribe. The history of traditional or ceremonial dress and regalia worn by Native American Indians is a fascinating subject. The following fact sheet contains interesting facts and information on the Native Indian feathered War Bonnet. War Bonnet Fact 9: Every feather in warbonnet headdress was awarded by the tribal elders for some great deed, usually in warfare. 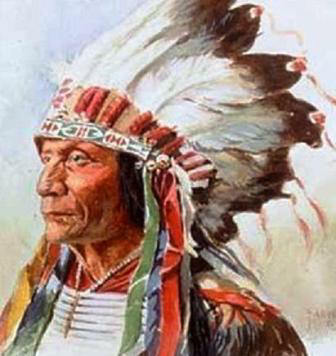 This practise lead to the expression "a feather in his cap"
The picture depicts a Chippewa warrior called 'A-wun-ne-wa-be', meaning "Bird of Thunder". It was painted by the famous artist George Catlin (1796-1872) at Fort Gibson in 1834. 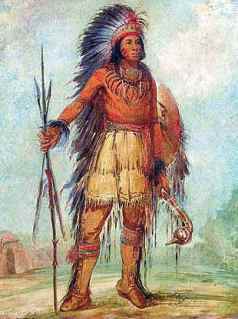 The Chippewa warrior is wearing the full regalia of a Great Plains Indian with a magnificent feather war bonnet with a long trailer of feathers that that he proudly wore as symbol of honor and his accomplishments. His traditional and authentic war bonnet consisted of a band to which eagle feathers, ermine fur and beadwork with feathers attached that trailed to the floor. War Bonnet Fact 11: Each time a warrior earned a feather, he would either wear it or displayed it on a pole used for ceremonial occasions and rituals. Once a warrior had collected enough feathers, they were then made into a headdress. The reasons for wearing the traditional Native Indian war bonnet changed over time. The demise of the Native Indian tribes following the 1830 Indian Removal Act led to stereotyping and misunderstandings. Native Indians were expected to wear warbonnets in spectacular 'Wild West Shows' run by men like Buffalo Bill which was formed in 1883 and lasting until 1913. Chiefs and Leaders of Native Indian tribes were included in important occasions. 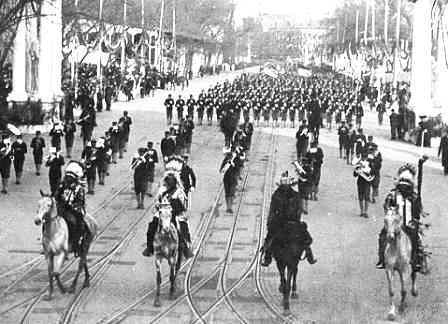 The photograph was taken in 1905 at President Roosevelt's Inauguration Parade. The famous Apache chief Geronimo, is one of the Native Indians who led the parade. The names of the other chiefs were Quanah Parker of the Comanche tribe, Buckskin Charlie from the Ute, Hollow Horn Bear and American Horse of the Sioux and Little Plume from the Blackfoot tribe.